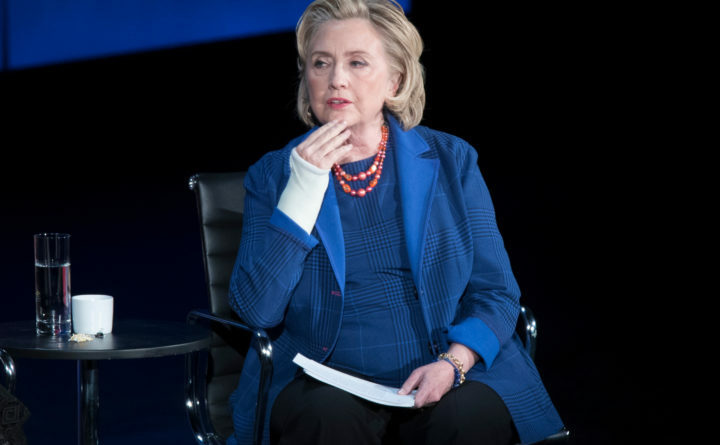 Hillary Clinton speaks during the ninth annual Women in the World Summit in New York, April 13, 2018. WASHINGTON — The Justice Department inspector general has completed a draft of its report criticizing law enforcement’s handling of the Hillary Clinton email probe, and current and former officials will begin reviewing the findings this week and lobbying for changes before the report likely becomes public next month. Inspector General Michael Horowitz notified lawmakers in a Wednesday letter that the draft report was complete and being made available to the agencies and individuals examined in the probe. The report is expected to blast former FBI Director James Comey for various steps he took in the investigation, particularly his announcing in July — without telling his Justice Department bosses what he was about to say — that the FBI was recommending that Clinton not be charged, and for revealing to Congress just weeks before the presidential election that the bureau had resumed its work. It also will likely take aim at others at the FBI and Justice Department, and provide President Donald Trump, a frequent a vocal critic of the department and Comey in particular, political ammunition to press his case that law enforcement has been out to get him. Trump last month blasted former FBI Deputy Director Andrew McCabe after the inspector general released a separate report accusing the ex-No. 2 official of inappropriately authorizing a media disclosure, then lying several times to investigators about it. Horowitz has since January 2017 been investigating broad allegations of misconduct involving the handling of the Clinton email probe, including Comey’s various letters and public statements on the matter and whether FBI or other Justice Department employees leaked nonpublic information. His opening of the investigation came amid an outcry from lawmakers and others, who alleged that Comey violated long-standing policies with his communications about the case and that information seemed to have leaked inappropriately — perhaps to former New York City Mayor Rudy Giuliani, who is now serving as the president’s private lawyer. Those being given an opportunity to review a draft of the report include Comey, McCabe, former Attorney General Loretta Lynch, former FBI lawyer Lisa Page and FBI agent Peter Strzok, according to several people familiar with the matter. Page and Strzok were both key figures in the Clinton email probe, and they came to the particular attention of the inspector general and later, the public, for exchanging anti-Trump texts. The two also worked on Special Counsel Robert Mueller III’s team, though both have since left or been removed. Page no longer works at the FBI. The FBI’s investigation of Clinton’s use of a private email server already has been intensely scrutinized by reporters and lawmakers, though the inspector general presumably will have access to documents and witnesses that others would not. Comey has also discussed his decisions in the case in his recently released book and in media interviews, generally defending the unorthodox steps the bureau took.